Perfect Yucatecan Day: Part II (Acanceh and Mayapan) | Dream! Go! Live! Posted on November 1, 2011	by dream!go!live! 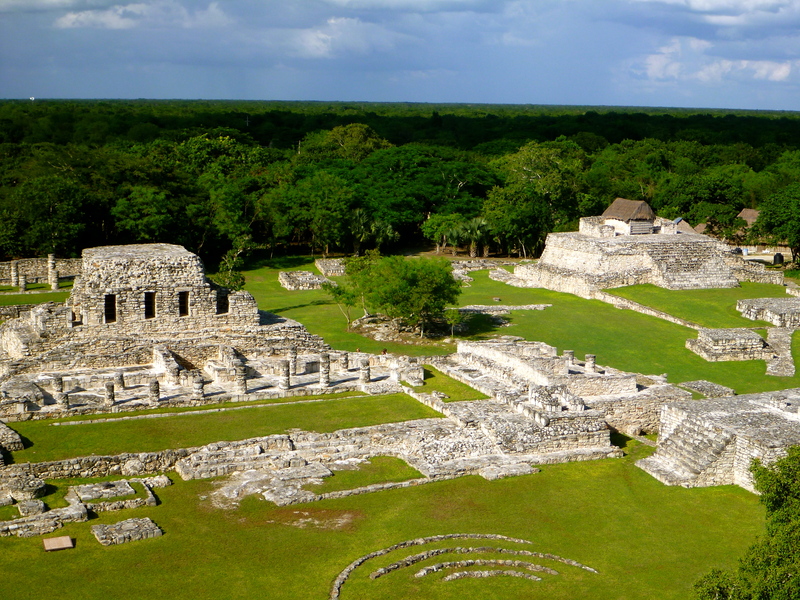 It is believed that Mayapan was one of the most important Mayan cities, along with Chitzen-Itza and Uxmal. 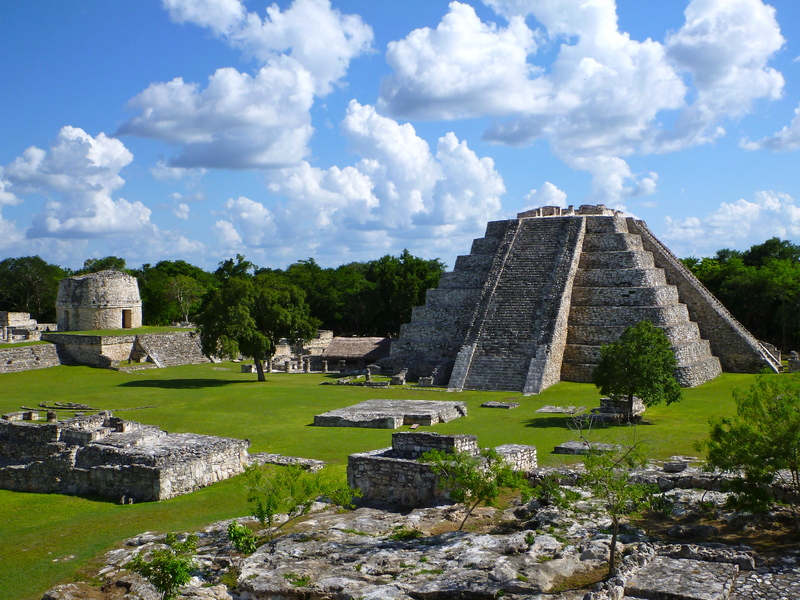 With ~4,000 structures making up Mayapan, it’s as large as Chitzen-Itza but without Uxmal’s UNESCO World Heritage designation or Chitzen-Itza’s fame as one of the New Seven Wonders of the World, Mayapan’s ruins don’t receive the same attention as the other two and is seldom visited. After starting the day with amazing Yucatecan tacos at Wayan’e, we set off in earnest for the main event. 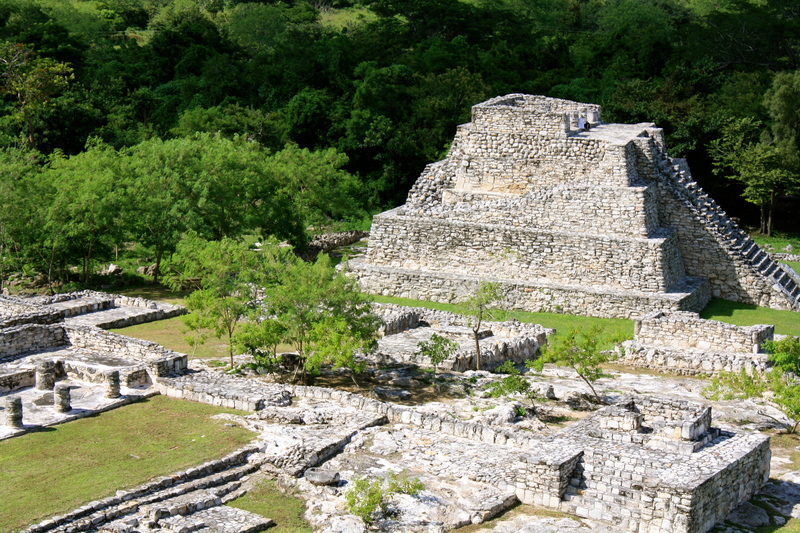 Our primary goal was to visit the ruins of Mayapan but since we had a car at our disposal, the Bennett family and I first stopped in a small town called Acanceh (quejido de venano or “lament of the deer” in Maya). In Acanceh’s zocalo (main square) next to little shops selling snacks and Coca-Cola, you immediately notice a bright yellow church and a large pyramid sitting right next to it. With a quick turn of the head, you can take in pre-hispanic, colonial, as well as modern day Mexico. In this case of “one of these things isn’t like the others,” the answer seems to be “all of the above.” It’s oddly jolting yet I think it’s an accurate representation of what this part of Mexico looks like. You start with deep Mayan roots of history and tradition, a thick trunk made of Spanish culture and religion, and branches of 21st century conveniences. It makes for a fascinating tree called Yucatan. After taking a peak at a modest church, we found the caretaker/guard for the large pyramid who opened the gates and led us up the pyramid to the top. There he showed us large masks or mascarones, that were recently excavated. There were eight in total, these giant stucco masks were placed on top of this pyramid to face four different directions. 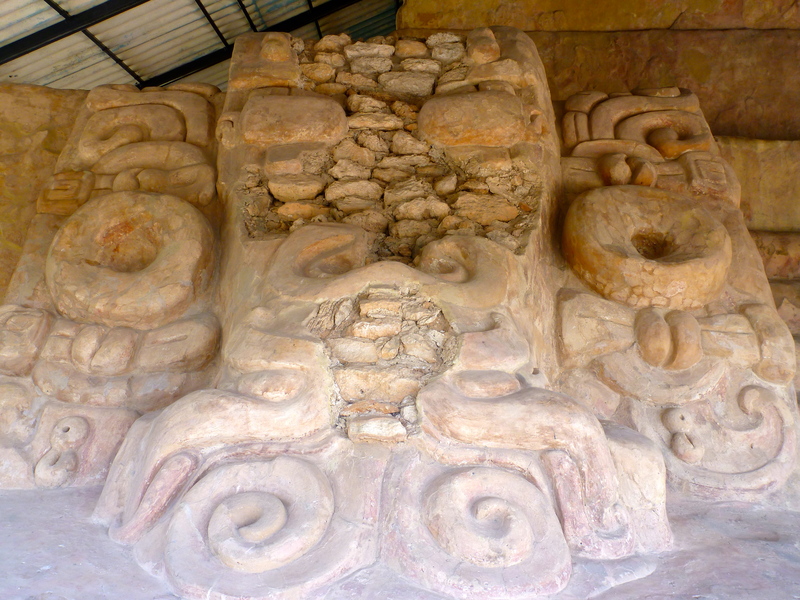 He said since all eight were missing their noses so it’s difficult to say for sure, but they have characteristics of the sun god found in other Mayan ruins. He added that restoration and excavation work around Acanceh is ongoing, and they’re finding new things everyday. He then left us to explore the grounds on our own so we took our time climbing up and down the other pyramid in the back. We were going to follow what’s caledl the “convent route” and go to the next town of Tecoh but to make sure we had enough time in Mayapan, we drove past Tecoh and headed straight over to Mayapan. As we walked in, we were greeted by two large, immaculately preserved pyramids and an observatory. We were fortunate to find no one at the ruins at all except for another family who left a few minutes after we arrived. I climbed up one pyramid while the Bennett family took on the observatory and the other pyramid. I was told that the main pyramid at Mayapan and the observatory were smaller replicas of those found in Chitzen-Itza, but unlike Chitzen-Itza visitors are free to explore anywhere we pleased. I sat alone on top of my own pyramid, at first to take in the incredible ruins of Mayapan and then to look out to the forest that hid the remaining ~3,990 structures I’d read about. I couldn’t make anything out except for the baby blue sky, puffy white clouds, and trees in a dozen different shades of green. But there I sat with my eyes closed, to imprint the beauty of the place on my memory and to send gratitude out into the wind. The entire ruins of Mayapan to myself! I think if there were more people at Mayapan, we may not have stayed as long as we did. But we were so giddy and happy to have the entire archaeological site to ourselves we went and poked around every nook and cranny we could. We even did a few silly yoga poses on top of a pyramid and Theo jumped off a few places channeling his love for snowboarding tricks. This entry was posted in 2011, Mexico, Travel and tagged Acanceh, Chitzen-Itza, Mayan Ruins, Mayapan, Mexico, Uxmal, Yucatan. Bookmark the permalink.